Most of us aren’t too concerned about outdoor décor right now, it’s just too cold and we’ve still got a little while before spring finally comes. 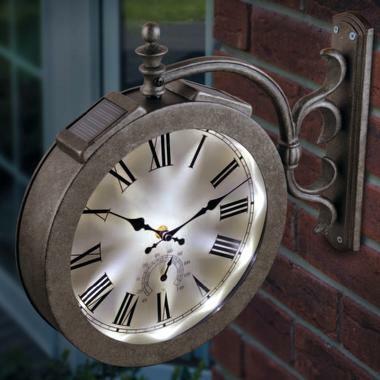 Well if you do like to get started early, to make sure your patio is looking great, you might enjoy this wall clock that gives an old world feel. It’s solar and the perfect thing to finish off your patio. As soon as it gets dark, it will put off a nice glow with its 12 bright LED lights. It might not be enough to really see much by, but it will at least put off a decent glow so you aren’t fumbling around in the dark. It also has a thermometer on the face of the watch. It’s a small thermometer, so you wouldn’t be able to hang this too high, otherwise the thermometer wouldn’t be readable. The light can either kick on automatically or you can use the manual on/off switch. Although it is solar, it still needs a AA battery, which they say is for movement. You can pick it up for $119.99 on Sky Mall. Where can i find this? it is not on sky mall!